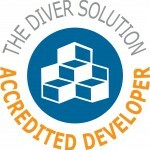 We are delighted to announce that Chartwell IT has been awarded the official ‘The Diver Solution Accredited Developer’ status following from work we have carried out for customers that are now using The Diver Solution to gain valuable insight into their businesses. Along with this acreditation, we are also very pleased to be a member of a new association, the Diver BI Group. This organisation is made up of a team of industry experts in the UK and Ireland specialising in the implementation and support of Business Intelligence applications using The Diver Solution from Dimensional Insight. For more information on the group please visit diverbi.com, or see our partnerships page.